they would like to do their best, meaning, reach their maximum performance ability. It is a matter of achieving their absolute limit in speed, strength, endurance and skill, and combining these elements with performance. Different athletic performances can be likened to a spectrum. 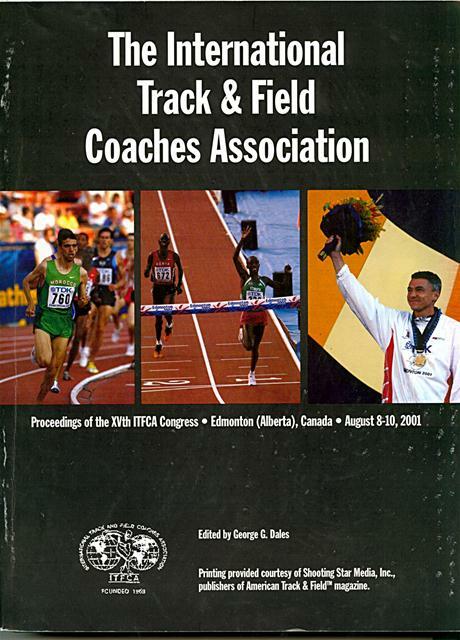 On one side of the spectrum are aesthetic events such as gymnastics, diving, and figure skating where success depends on the ability of the athlete to create movements that are pleasing to the referees. In the middle of the spectrum are the endurance activities, for which the athlete tries to maintain muscular contractions, for long periods of time, at sub maximal intensity levels. On the other side of the spectrum arc the explosive activities, such as sprinting, jumping and throwing, where the athletes try to achieve maximal coordinate power. Biomechanical analysis allows investigation of the particular event in order to create the ideal model of performance. Analysis of the performer and subsequent comparison with the ideal model occurs to allow immediate feedback to the athlete showing the deviation from the optimum. tem is portable utilizing a 2 kg notebook computer. Cameras can be taken to the location of the activity and positioned in any convenient manner, so as not to interfere with the subject. The Automatic process requires reflective markers to be placed on the athlete's joint center. After digitization, the computation phase of analysis is performed to compute the true three dimensional image space coordinates of the subject's body joints from the two-dimensional digitized coordinates of each camera's view. Computation is performed using a direct linear transformation or the newer and more powerful Physical Parameters Transformation (PPT), to determine the true image space locations in 3-D. PPT is the process using two or more cameras to create 3-D coordinates from the 2-D obtained from one camera. to compute body joint velocities and accelerations. At the completion of smoothing, the true three-dimensional body joint displacements, velocities and accelerations have been computed on a continuous basis throughout the duration of the sequence. At this point, optional kinetic calculations may he performed to complete the computation phase. Body joint displacements, velocities and accelerations are combined with body segment mass distribution to compute dynamic forces and moments at each of the body joints. Muscular contribution to these forces and moments can then be computed by selectively removing the inertial and gravitational kinetic components. Body position and body motion can be presented in both still frame and animated "stick-figure" formats in three dimensions. Plots of body joints and segments, linear and angular displacements, velocities, acceleration, forces and moments can be produced in a number of format options. 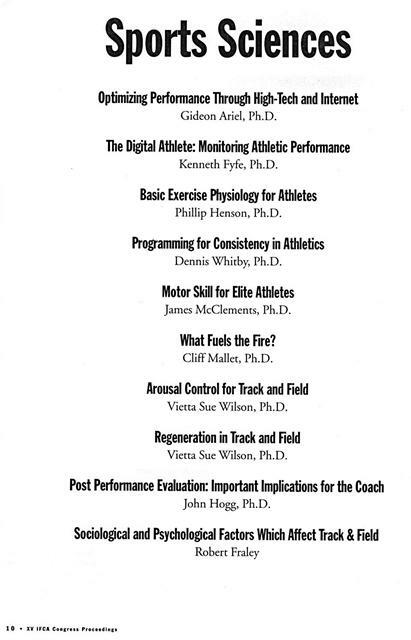 The preceding discussion has illustrated the use of movement analysis to assess functional capacity. However, functional capacity can also he measured directly by resistive dynamometry devices. The system employs computerized feedback control of both resistance and movement during training exercise. 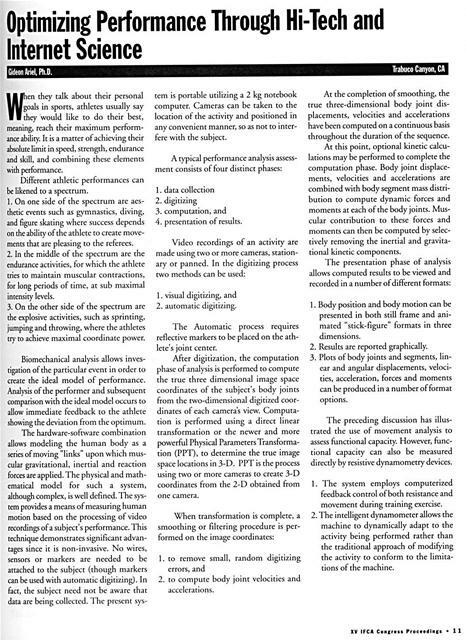 Case studies in applied biomechanics demonstrate the importance of considering the true patterns of motion in determining efficient performance. One of the most important parameters in training is the ability to allow the performer to achieve a movement pattern of resistance or the pattern of motion experienced by the user during the actual activity. Then, there exists the ability to modify the pattern by reprogramming the dynamometer. The standard isokinetic equipment cannot achieve these requirements. The value of applying the principles of biomechanics to the assessment of functional performance has been clearly demonstrated. Movement analysis provides the means to quantify human activity and to provide insight into the meth anisms that contribute either to superior or inferior levels of performance. In addition, a technology has been presented that permits exercise and rehabilitation patterns to biomechanically duplicate the target activity as a measure of function capacity. History was made at the Atlanta games by utilizing the Internet to provide Biomechanical data immediately for use at remote sits. Video cameras were utilized to record the events and the data was transmitted to computers on-site for conversion to digital format. Video clips of individual performances in various events were made available for downloading free of charge from the Ariel Dynamics web site usually within hours of the actual performances. The posted events were filmed from various perspectives utilizing numerous cameras providing data capable of yielding three dimensional biomechanical results. This rapid availability of sporting activities for study by scientist, athletes, coaches and the general public on the Internet is a history making event. It further illustrates the potential of the internet as a research tool. In the present study, the biomechanical analysis of the discus throwing was performed. Data was collected on preliminaries and final performances. Video cameras were placed in key positions, approximately 45 degrees to the plane of the path of the thrown object or of the athletic performance itself, in order to record the particular event. As few as three and as many as nine video cameras were utilized. One camera was placed to the rear of the event. A third camera was placed at approximately 45 degrees to the event. All video cameras recorded at 60 fields per second. 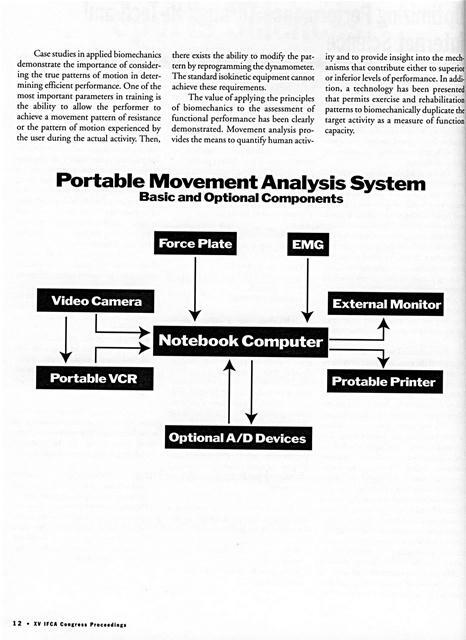 Figure 1, illustrates some of the various camera positions. These are dynamics video clips and one can control and observe the movement. For non compress full video one can log into our web site at: http://www. ariel-net.com and download the original video clips through FTP connection. Dimensions of known factors on the field and various other measured objects in the field of view were used for the calibration points. Because multiple cameras were utilized, the best views were selected for further analysis. The video pictures were grabbed from each view with Intel Smart Video Recorder Plus Frame Grabber and the files were stored in Audio Video Interlace Format (AVI). This data was then uploaded, via satellite, to the Ariel Dynamics web site. The stored data was available to all free of charge. 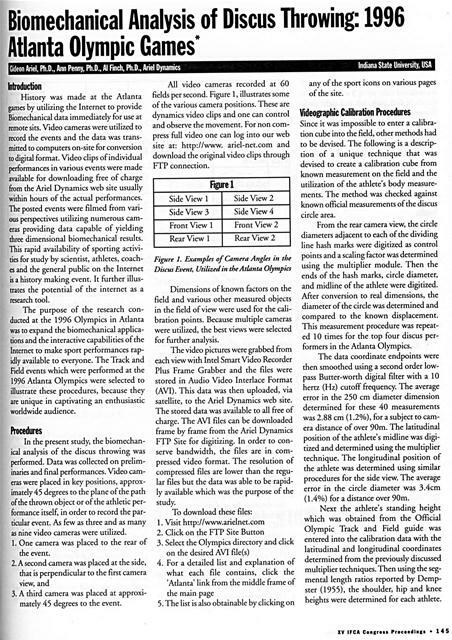 The AVI files can be downloaded frame by frame from the Ariel Dynamics FTP Site for digitizing. In order to conserve bandwidth, the files are in compressed video format. The resolution of compressed files are lower than the regular files but the data was able to be rapidly available which was the purpose of the study. The list is also obtainable by clicking on Matta State University, USA any of the sport icons on various pages of the site. Since it was impossible to enter a calibration cube into the field, other methods had to be devised. 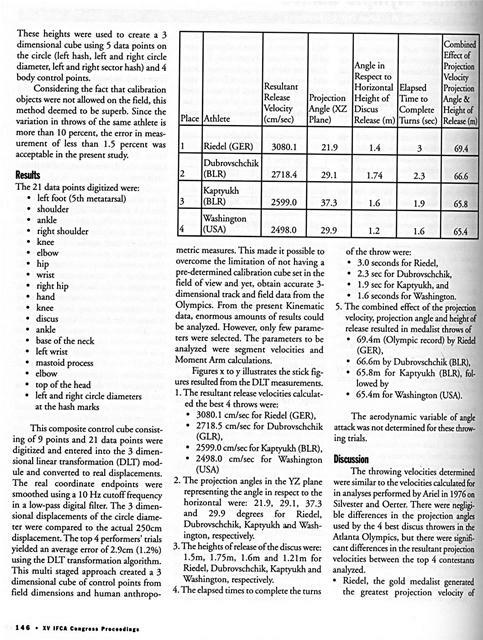 The following is a description of a unique technique that was devised to create a calibration cube from known measurement on the field and the utilization of the athlete's body measurements. The method was checked against known official measurements of the discus circle area. The data coordinate endpoints were then smoothed using a second order lowpass Butter-worth digital filter with a 10 hertz (Hz) cutoff frequency. The average error in the 250 cm diameter dimension determined for these 40 measurements was 2.88 cm (1.2%), for a subject to camera distance of over 90m. The latitudinal position of the athlete's midline was digitized and determined using the multiplier technique. The longitudinal position of the athlete was determined using similar procedures for the side view. The average error in the circle diameter was 3.4cm (1.4%) for a distance over 90m. 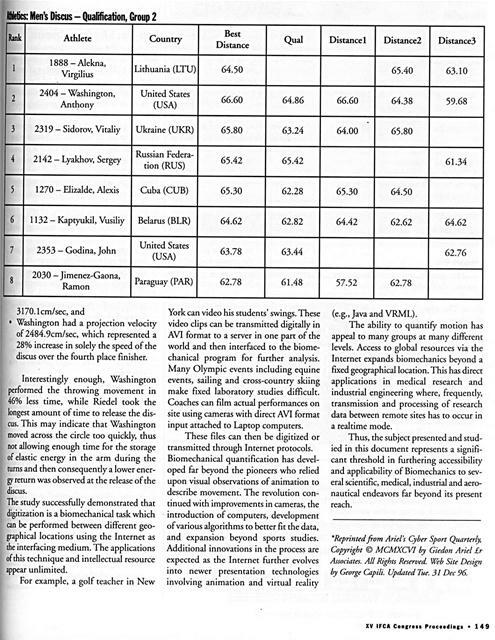 Next the athlete's standing height which was obtained from the Official Olympic Track and Field guide was entered into the calibration data with the latitudinal and longitudinal coordinates determined from the previously discussed multiplier techniques. Then using the segmental length ratios reported by Dempster (1955), the shoulder, hip and knee heights were determined for each athlete. These heights were used to create a 3 dimensional cube using 5 data points on the circle (left hash, left and right circle diameter, left and right sector hash) and 4 body control points. Considering the fact that calibration objects were not allowed on the field, this method deemed to be superb. Since the variation in throws of the same athlete is more than 10 percent, the error in measurement of less than 1.5 percent was acceptable in the present study. metric measures. This made it possible to overcome the limitation of not having a pre-determined calibration cube set in the field of view and yet, obtain accurate 3dimensional track and field data from the Olympics. From the present Kinematic data, enormous amounts of results could be analyzed. However, only few parameters were selected. The parameters to be analyzed were segment velocities and Moment Arm calculations. ï¿½	1.6 seconds for Washington. ï¿½	65.4m for Washington (USA). The aerodynamic variable of angle attack was not determined for these throwing trials. The throwing velocities determined were similar to the velocities calculated for in analyses performed byAriel in 1976 on Silvester and Oerter. There were negligible differences in the projection angles used by the 4 best discus throwers in the Atlanta Olympics, but there were significant differences in the resultant projection velocities between the top 4 contestants analyzed. 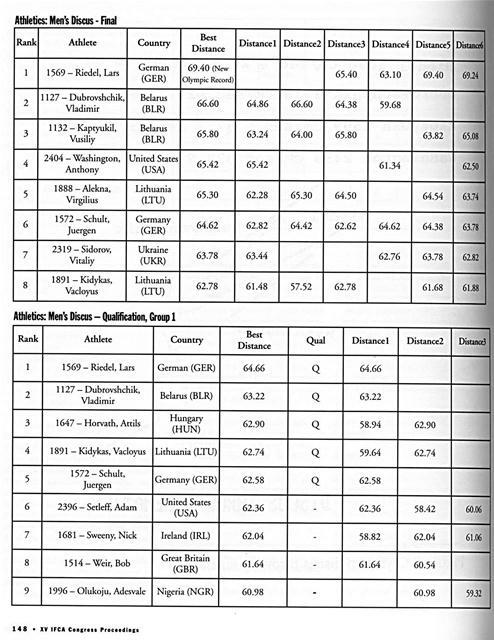 Washington had a projection velocity of 2484.9cm/sec, which represented a 28% increase in solely the speed of the discus over the fourth place finisher. 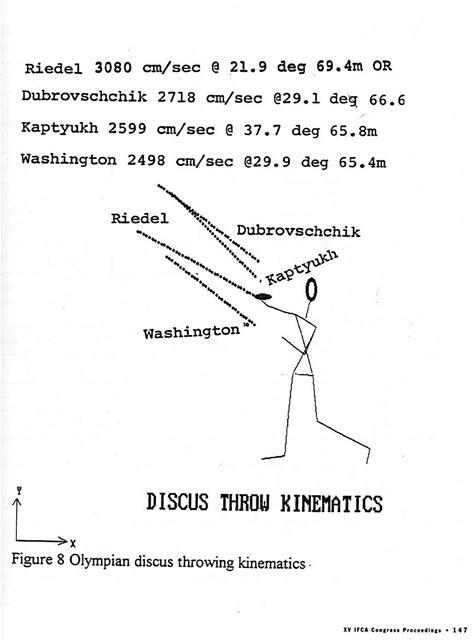 Interestingly enough, Washington performed the throwing movement in 46% less time, while Riedel took the longest amount of time to release the discus. This may indicate that Washington moved across the circle too quickly, thus not allowing enough time for the storage of elastic energy in the arm during the turns and then consequently a lower enerU return was observed at the release of the discus. For example, a golf teacher in New York can video his students' swings. These video clips can be transmitted digitally in AV] format to a server in one part of the world and then interfaced to the biomechanical program for further analysis. Many Olympic events including equine events, sailing and cross-country skiing make fixed laboratory studies difficult. Coaches can film actual performances on site using cameras with direct AVI format input attached to Laptop computers. The ability to quantify motion has appeal to many groups at many different levels. Access to global resources via the Internet expands biomechanics beyond a fixed geographical location. This has direct applications in medical research and industrial engineering where, frequently, transmission and processing of research data between remote sites has to occur in a realtime mode. Thus, the subject presented and studied in this document represents a significant threshold in furthering accessibility and applicability of Biomechanics to several scientific, medical, industrial and aeronautical endeavors far beyond its present reach. 'Reprinted from Ariel's Cyber Sport Quarterl)t Copyright ï¿½ MCMXCVI by Giedon Ariel Lr Associates. All Rights Reserved Web Site Design by George Capili. Updated Tue. 31 Dec 96. Generated on 4/20/2019 3:32:13 PM (PST) ADI/HQ/GBA/2019/ARIELCLOUD/v3.0.2018.0126.